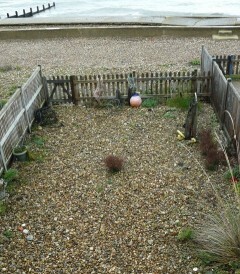 If I thought my clay soil made gardening a challenge, it is nothing compared to the unique set of challenges faced by friends of mine who have a house right on the sea front in Selsey. Although this pebbly garden is probably not prone to frost and snow, it is constantly exposed to high winds and huge amounts of sea spray heavy with salt, and beneath those pebbles is sandy soil that doesn’t hold water well. 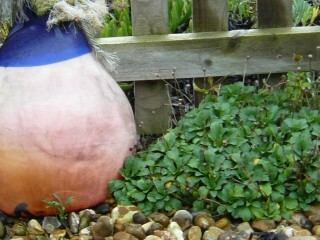 As you can see, the garden is only a few metres from the sea and there is no natural windbreak, so my friends need super tough plants that will survive such inhospitable conditions. 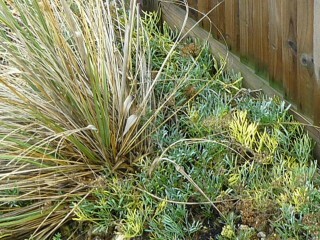 Of all the plants they have tried so far, only one grass and a few hardy succulents have stuck it out. Having said that, the star turn in the garden is an exotic-looking bromeliad Fascicularia bicolor, which – fortunately – thrives on neglect. 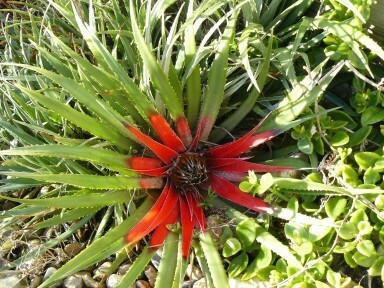 Endemic to Chile, it has tough spiney rosettes of leaves, the centre of which turns bright scarlet as it comes into flower. So we’re looking for suggestions. All comments welcome.